As the population of the world shows no signs of slowing down, there have been suggestions to increase food productions in farming to enable us improve food security. Apart from the current global agricultural issues like climate change, lack of finance, poor policies towards agriculture, Land unavailability, this happens to be the one of the problems farmers are facing today which is difficult to resolve. There is the need to find ways to produce higher yields, considering factors that increase agricultural product in order to come up with methods to increase crop yield and manage the demand in the market. This can be done with the help of precision agriculture. There are environmental and economic benefits of using precision agriculture technology, and with this smart digital farming, crop yields can be greatly increased. Since precision agriculture helps in improving the production in crops, it aids in eliminating the food security concerns all over. By taking into account the advantages of real-time analysis, field-mapping, aerial imaging, farmers are able to improve their techniques in farming. These technologies help in making the right decisions and increasing the productivity. With the advancements in agriculture with technology like drones and precision farming, the process of crop management has become much easier. Since these drones will have cameras attached to them, the crops can be monitored easily. Nutrient or water deficiencies can be tracked, fertilizers and pesticides can be sprayed timely when needed. The images received through these cameras will be of high resolution too. With this, the farmers will get to have the aerial view of the field which can not be witnessed otherwise. Through this method, any issue in the field can be spotted immediately. 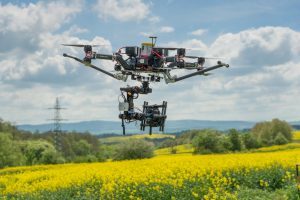 With the help of manned aircraft and aerial imaging, there is the new view received by the farmers which cover the aerial view of the entire farm. Since there are high-tech cameras in place, the images will be highly accurate and hence any problem in the crops can be noticed easily. A continuous record of the data can be kept which can be cross-referenced with other variable factors like the water levels, potassium content, plant state etc. The presence of insects can be spotted immediately and it can be removed. The pesticides and fertilizers can be used optimally with this technique. The overall health of the crop can be determined easily and precisely with this smart digital farming. Farming can become complicated in certain situations where several decisions have to be made in a short span of time. This often make farm life to be ‘hard’ because if these decisions are not right then it might cost the health of the entire farm and yields would be seriously reduced in terms of quantity and quality. By implementing precision farming along with the various advanced Ag technologies, the important data regarding the crops can be collected and analyzed to arrive at a profitable decision timely. For example, negative effects of weather and climate change on crop production can be lessened since these changes most times occur gradually and this can easily be detected while the farmers make proactive measures against it. With the information presented regarding the growth and overall health of the crops and the fields, the decisions can not only be made accurately but can also be made on a real-time basis. There are devices like the robot censor, which can be installed to monitor the crops and to collect data about them. These data can be accessed by the farmer real-time. This technology can bring solution to climate change effects on agriculture because it’s really useful when it comes to monitoring the weather conditions, preventing hazards or reversing it. The severity in the weather conditions can be predicted earlier and the farmers can come up with mitigation strategies to control weather related hazards and risks in agriculture. With the help of precision agriculture, farmers can reduce the labor cost of production in farming as the available resources can be put into optimal use. The present resources can be taken maximum advantage of, which will eliminate the need for extra labor or resources. There is also the mapping tool available which will allow the monitoring of the field and will also come up with an optimal planting schedule. This will give the option of deciding the timeline as to when to plant the crops and when to harvest them. Apart from this, the decision of which crop to plant can also be made depending on the timeline. The choice of fertilizers, the quantity and the type of fertilizer can be decided and applied with the help of precision agriculture.